If your lawn is looking thin in spots, brown or bare, a quick trip to the local garden center or equipment rental shop will provide you with an opportunity to revitalize your stressed grass. Lawn aeration is a common method used to break up thick layers of thatch and compacted soil and allow your grass to grow better. Yet, once aerated the work is not quite done. There are a few quick methods for care after aeration to provide the best results for your lawn. Whether you laid down sod or planted seeds, over time your lawn will be impacted by activities that compact the soil, making it difficult for oxygen, water and other healthy nutrients to reach the roots of your grass. 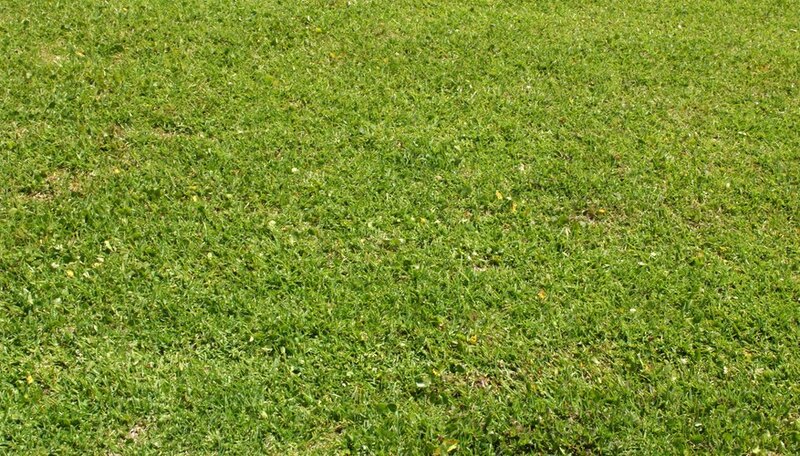 The result is a lawn that is brown, bare or otherwise unsightly. Aeration is a quick way to win back your lawn. Using either a rental power core aerator or a power rake, you can loosen compacted soil and thick thatch. Both of these tools punch small holes into the sod, providing avenues for air and water to reach the grass roots. If you live in the northern regions that experience a hard frost, the best time to aerate is in the fall months, before the first freeze. In warmer climates, aerate in the spring when the grass resumes actively growing following the winter dormancy. Power aerators are strong tools and you’ll want to exercise caution and care when using such equipment. Be careful to avoid electrical lines or lawn sprinkler heads that are buried in the earth and avoid using your power aerator on a steeply sloping hillside. For best results, run your aerator twice along the lawn in perpendicular rows, so your aeration holes are spaced evenly, roughly 2 to 3 inches apart. Also, start your work in the morning, when the ground is soft, but avoid rainy days when the ground is muddy or too soggy; the result could be a real mess. The day before you plan on aerating, make sure your lawn has received enough water, either through artificial watering or through natural rain fall. Mow your lawn before aeration, cutting it at least half as tall as you normally would to make it easier when using the equipment. After you are finished with the aeration, water your lawn again. The aerating process is stressful on your grass, so you'll need to infuse your lawn with a healthy dose of water. Rake your lawn after it has been aerated as well. After aeration, your lawn will be covered in small plugs of dirt. Raking will help break up the plugs and give the roots of your grass a better chance to grow. If you are planning on reseeding your lawn after aeration, there are some simple steps you can take. Use a power rake to slash through any thatch and score the surface of the ground. If you are only planning on reseeding a small area of grass, you can use a flat-nosed shovel to cut slits into the ground. Your slits should be 1/4 inch deep. Always rake after cutting your slits and before planting seeds or laying down fertilizer to allow for maximum exposure of the roots and seeds. After seeding, tamp down the ground with the back of a rake or other tool to make sure the seeds are properly planted.